Discover your deepest sensual desires with the Sensuelle Homme Pro Prostate Massager in black. 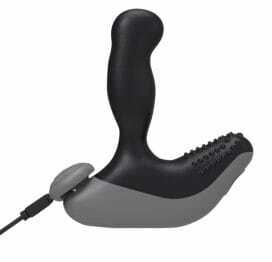 Features 10 intense vibrations and pulsations for prostate stimulation. The tip of the massager is a ball-shaped stimulator with a 3-speed up and down motion that can be used simultaneously with the 10 vibrations mode to satisfy your Sensuelle desires. Ultra smooth, silky touch to heighten your pleasure. Nu Sensuelle Homme Pro has a deeply intense motor, with multi function modes and vibrations. Easy to recharge so that the Nu Sensuelle is always ready at your fingertips whenever you are in the mood for an amazing experience. 10 functions. USB Rechargeable. Multi-function control touch. The new generation of personal stimulation. Rechargeable by USB or wall outlet charge. Phthalate free medical grade Silicone, ABS. Charge time 4 hours. Running time 60 minutes to 75 minutes. Water resistant for cleaning purposes. Length 8.5in, Insertable Length 5in, Width 1.45in max. 4 hours of charge yields 1 to 1.25 hours play. Also includes charging dock, USB charging cord, AC adapter, storage bag, and instructions. 1 year warranty.